Dr Annu Dhir did her MBBS from S S Medical College, Rewa, diploma in Gynaecology from S K E M Hospital and Post Graduation in Hospital Management from Apolo Hospital. After that she has joined Air force as a family doctor and for the 15 years she was working with the Air force. Then she came to Dehradun where her mother in law was practicing and she joined her and since then she is practicing Gynaecology for the last 32 years. Gynaecology is the branch of physiology and medicine which deals with the functions and diseases specific to women and girls, especially those affecting the reproductive system. "I have done my medical education from Rewa Medical College and PG diploma in Gynaecology from Puna and Hospital Management diploma from Apolo Hospital, Delhi. After that I have joined Air force as a family doctor and for the 15 years I was working with the Air force. 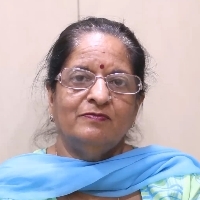 Then I came to Dehradun where my mother in law was practicing and I joined her and since then I am practicing Gynaecology for the last 32 years." Counselling is a type of talking therapy that allows a person to talk about their problems and feelings in a confidential and dependable environment. Its also to change the lifestyle of people. "I am a Gyneacologist. I have joined VLCC 5 years back and I am regional doctor of VLCC."